A Hodgenville man was arrested last Tuesday, August 30, for cultivating and trafficking marijuana after police found an indoor marijuana growing operation inside a residence on Earl Jones Road in Hodgenville. A local overdose awareness event was held last Wednesday to help raise awareness about the drug epidemic and rising number of overdoses. 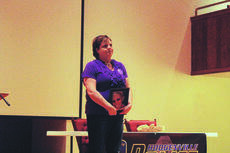 The event was held by Hodgenville Police Sergeant James Richardson and Vickie Dawley, who lost her daughter, Shalayna Skaggs, to an overdose on November 1, 2014. The local event was held Wednesday, August 31, which was also National Overdose Awareness Day throughout the country. There are many places that have seen the passing of time and have served a multitude of purposes, and become the center, even heart of the community they belong to. Buffalo School Gym is no different. From it’s days as the gym for East Lynn College to the excitement of a community coming together to cheer on their boys at a basketball game the Buffalo gym has been just that, the heart of its’ community. When Elizabeth Skaggs wanted to mail a letter or pick up her mail, she traveled no farther than to her basement where she was postmistress of the Gatton, Kentucky, post office. She was the second postmistress at Gatton, just a stone’s throw from Mt. Tabor Baptist Church. Her mother-in-law, Viola Skaggs, was the first postmistress of the office which originally was located in a country store on the same property. The community is buzzing about a recent juvenile party that was busted up by police around 2 a.m. on Sunday, August 28. According to Hodgenville Police Sergeant James Richardson, several police officers responded to a complaint of intoxicated juveniles at a residence on North Walters Avenue in Hodgenville. Once officers arrived at the residence, he said around 15 to 20 of the alleged juveniles fled on foot and police were unable to locate them. LaRue County Judge Executive Tommy Turner swore in Olivia Reed as the county treasurer as fiscal court met at the courthouse in Hodgenville on Tuesday, August 23. 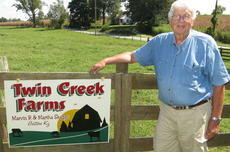 Reed replaces Lauralene “Luke” Reed who is retiring Wednesday, August 31 after serving 16 years as county treasurer. Joel Ray’s Lincoln Jamboree in Hodgenville celebrates its 62th anniversary on Saturday September 10. The “signature anniversary edition” show will feature a star line up including comedy and vocals by Ricky Puckett; the sweetheart of the Jamboree, Tiffany Lynn Puckett; world champion fiddler, Billy “The Kid” Nett and country music vocalist and world renowned ventriloquist, Kelly Casey. Hope shines on in every city in every county of our beautiful state. On Thursday, September 15, LaRue County Relay for Life is asking you to join your neighbors and fellow cancer fighters across Kentucky to turn on your front porch light. These lights, while a simple show of support, signify the united fight against cancer here in our Commonwealth. To record you support, snap a selfie of you on your lighted porch and tag our LaRue County Relay for Life Facebook page or #HopeShinesOnKY. Applications are currently being accepted for the 44th annual Lincoln Days Art Show. The show will take place during the annual Lincoln Days festival on Sunday, September 25 through Sunday, October 2. The winners will be announced during the opening on Sunday, September 25 from 2 to 4 p.m. The cost for the art show is $10 per entry. The show includes four divisions with cash prizes for winners in each division. The submission deadline is Wednesday, September 21 at the Lincoln Museum. The following food sanitation inspections were conducted by the LaRue County Health Center. The rating of the establishment is determined by subtracting weighted point totals of noted violations from 100. Unannounced inspections observe the overall operation including food source and protection, personnel, food equipment and utensil, maintenance of water and sewage systems, garbage and refuse disposal, insect, rodent and animal control, and storage of toxic items among others. 224 Farmhouse Diner 408 Upton Talley Road, Upton, 100.